LTD just recently serviced our BMW i8. Their customer service regarding scheduling was accomodating and they were able to service the vehicle within our scheduling criteria. Please take a look at what an i8 is and then you will appreciate the level of technical aptitude a person must possess to work on such a vehicle. They did a great job once again. Very pleased with the company as a whole. Excellent experience with Living the Dream Automotive. Julie in reception and Chris in repair were extremely responsive while they diagnosed a major issue with my SUV. The repair was excellent and done in 1 day with parts they had to order for delivery. 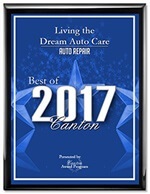 Highly recommend and I will be returning for future repairs to any of my cars. Thanks for your polite and courteous service....it is greatly appreciated! I would never even consider taking my car anywhere else. always very helpful, good service, and people there are humble and entertain you well. recommended. As usual, Living the Dream Auto Care is a dream! My headlights have been very dim at night, and so I brought my car in. It was as simple as them putting in new bulbs, and it was super fast and cheap (and they vacuumed and washed my car too!) This is why I come here. They didn't tell me I needed the headlight cases cleaned or replaced (which would have been more costly) or try to upsell me other services or repairs. A place you can TRUST - and super friendly too! I have never had my car detailed before but wanted to have it done. I had looked at the living the store and the overall appearance of the suggested it was clean and neat and I felt my vehicle would be handled with the same professional care and cleanliness. It was done perfectly.